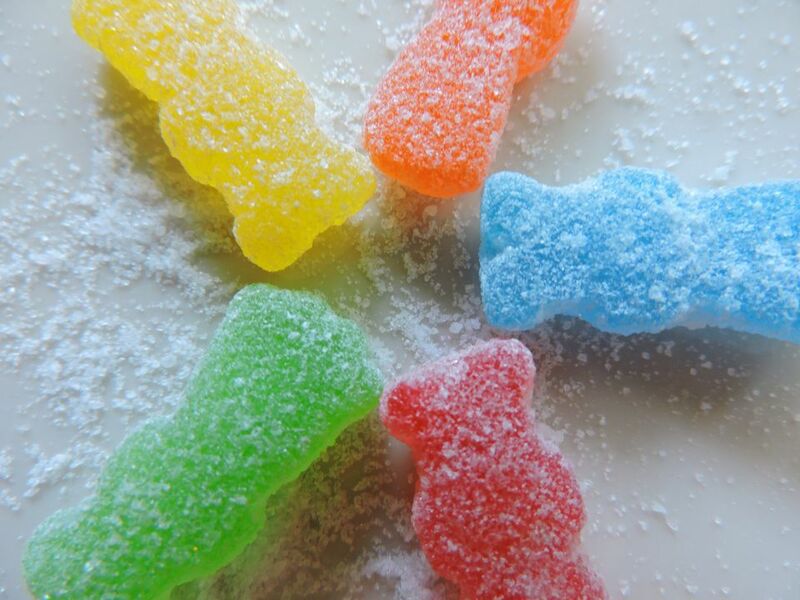 Do you remember those little sugar covered gummy children called Sour Patch Kids that made you pucker when you were a kid? That's what this margarita tastes like—and it's fantastic. The sour patch margarita captures the spectrum of sour flavors, mixes them up and strains them out into a flavor-filled, sugar-lined drink. It is perfect for hot summer afternoons or anytime you have a sour-sweet tooth. Like the gummi bear margarita, you can also add the gummy candies into the ice for an extra treat when you serve this on the rocks. The base of this margarita is a lime-infused tequila on top of which layers of fruit flavors are added. Midori gives it a brilliant green color and melon taste, triple sec backs up the orange juice, and sour mix brings in a sweet-tart citrus flavor. To complete the "sour patch" experience, a splash of tart lime finishes it off and you won't want to skip the sugar rim or sugar-coated lemon! Rim a chilled margarita glass with sugar, using a lemon or lime wedge to wet the rim before rolling it in sugar. While you have the sugar, dip half a lemon slice in it as well, gently shaking off any excess sugar. In a cocktail shaker with ice, pour the tequila, melon liqueur, triple sec, sour mix, and orange juice. Add a splash of lime juice to the top and garnish with a sugar-coated lemon. There are a number of options on the market for lime-infused tequila because it's a popular margarita ingredient. Some are actual infusions of lime while others are sweetened, turning them into tequila liqueurs. Look for bottles like Dulce Vida Lime Tequila, Hornitos Lime Shot, and Patron Citronge Lime Liqueur. Another option is to do your own infusion. Use 2 or 3 limes, rinsed and cut into wedges for a full bottle of tequila. The infusion should take 3 to 4 days, though you'll want to check it and let it infuse longer until it reaches your desired flavor. Fresh-squeezed citrus juices will give this cocktail the punch of tartness that it needs. For the lime, you can even simply squeeze a wedge over the drink. This margarita can also be served on the rocks or blended with 1 cup of ice. You could always use a non-flavored tequila, though it's a good idea to increase the lime juice a little bit. How Strong Is a Sour Patch Margarita? Typical for a shaken margarita, this cocktail's alcohol content should fall in the 19 percent ABV (36 proof) range. That's almost half the strength of a straight shot of tequila. While the sweet-tart taste may tempt you to drink more if you want to avoid a hangover that may not be the best idea!